Let’s try to STEM the gender gap. As I was reading my Sunday paper this morning I was transported back to the mid eighties when I was studying for my A-levels. I was sitting in a classroom with about 10 pupils in it & I was the only girl. I had chosen to study double maths & it hadn’t even occurred to me that I might be the only girl making that choice. This is a testament to the way my parents brought me up, to them my gender wasn’t a consideration in the choices I made & it was only when I reached that point that I came across the influence of another way of thinking. I can even distinctly remember the teacher saying “I wouldn’t be surprised if Dianne decides not to continue as she’s the only girl in the class” Giving up on the class hadn’t even occurred to me until that point. Don’t get me wrong as a teenage girl sitting in a class full of teenage boys I felt awkward but to me I’d made my choice & I would have persevered. Following those words I gave up maths completely. I’d be offered an “out” and I took it. Now I don’t blame the teacher for that, I made the decision & I’ve never been one for looking back & thinking “what if?” I wonder though if the teacher would have said those words if he’d realised the effect it was going to have? The reason this memory came to mind was an article in the Sunday Times about an OECD report due out next week. The report shows that the UK isn’t doing very well when it comes to making the most of our available talent in STEM subjects. In measuring the performance of 15 year old girls v boys in science across 67 countries the UK has one of the largest gender gaps. We are in the bottom five of the sample & that really isn’t good. The same OECD report last year showed that gender gaps in maths generally across the world had not improved in the previous 11 years. How sad is that? We’re talking & talking about this & yet we still haven’t found the solution. 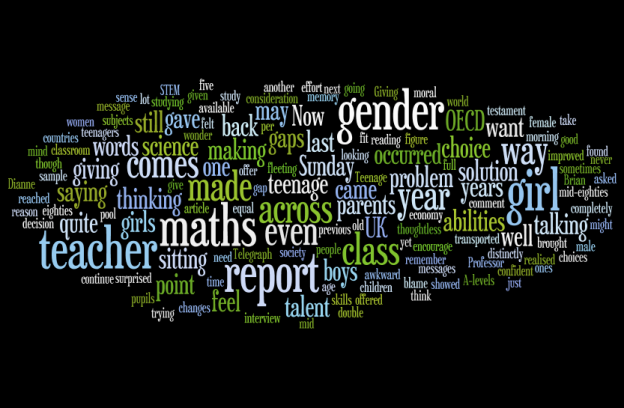 The report suggests that part of the problem is that girls don’t feel as confident of their abilities when it comes to maths & I find myself wondering where that comes from? Somewhere between the age of 9 and 15 their belief in their own abilities changes. Are we as a society still giving out the same message that teacher gave me in the mid-eighties? Teenage years are difficult ones at the best of times (for parents as well as teenagers!) & sometimes it can be a fleeting comment or a thoughtless phrase that may give someone that “out” I was given , that may suggest to them that they’re not quite up to it or won’t quite fit in. At a time when people are trying to figure who they are & who they want to be these comments can mean a lot more than they’re meant to. So we need to think about what we’re saying, what messages we are giving. As Professor Brian Cox said in an interview in the Telegraph last year when asked about women in science: “There should be 50 per cent. It’s not just a sense of moral obligation about equal opportunities. It’s about the talent pool. It’s about how do you fill this massive gap in skills that we have in the economy.” Now I can’t offer the perfect solution to this problem but I do feel we can all contribute in our own way. Changing this will take effort from all of us, male & female. So let’s encourage all our children, regardless of gender, to be everything they can & want to be. This entry was posted in Business, Education, Equality and tagged education, equality, gender gap, science, women, women in science on February 22, 2015 by dianne.